Most of the things here were freebies. I did pay full price for the ream of paper and the tabbed paged dividers because I needed those. They were cheaper than Walmart’s similar products, so it was ok. 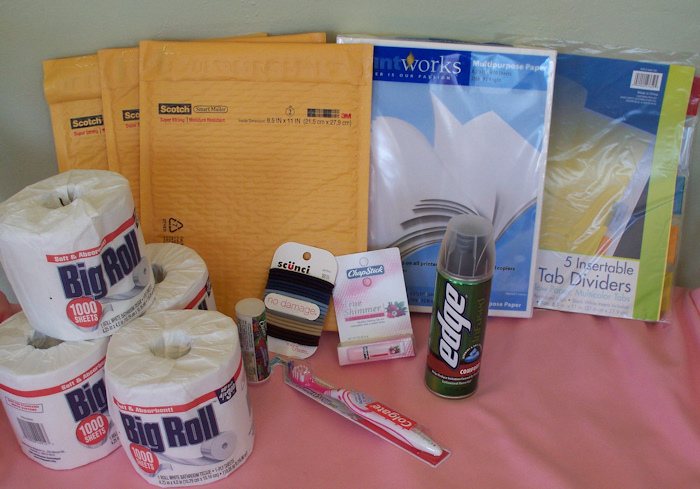 The toilet paper rolls were 2/$1 and the Bubble wrap mailing envelopes (for shipping books and CD’s) were 3/$1. The shaving gel, toothbrush, fiber supplements, chapstick and scunchi hair ponies were all free after register rewards. I had some register rewards to redeem, and I had manufacturers coupons for some things (so those were beyond free). I paid less than $14 cash and got $13 back in register rewards! Net cost – $1 today!